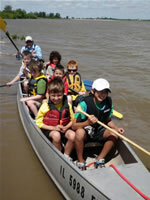 See the Mississippi River - Upper website for additional information. Primary recreational opportunities are listed below. Factoid: Represents the head of navigation for the Corps of Engineers Nine Foot Navigation Project and is located in downtown Minneapolis. The USAF Visitor Center is located at the Upper Lock and is open to the public year around. The Visitor Center provides an excellent view of the historic falls, the Minneapolis skyline and the historic mill ruins along the banks of the river. This area is within the Mississippi National River and Recreation Area. Authorized in 1930 to provide a 9-foot navigation channel between Minneapolis - St. Paul, MN and St. Louis, MO, the Upper Mississippi River Project offers extensive opportunities for water-based recreation, ranging from backwater hunting and fishing to long-distance cruising in the main channel. In the St. Paul District, the project flows through three National Wildlife Refuges, the Mississippi National River and Recreation Area, many State and local wildlife and recreation areas. Designated an American Heritage River, it offers visitors many recreational opportunities, including sightseeing along the river, visiting quaint river towns, viewing the wooded bluffs along the river, and watching bald eagles soaring.